Kubo is a bright young Japanese boy who tells stories. More fables and myths actually. Assisted with his folded paper figures and a guitar he regales the local villagers with tales passed down to him by his mother, who unfortunately has been beset by a tragedy so severe that she can no longer communicate with others effectively. So Kubo helps others lose themselves in his stories. Only it is time that Kubo himself gets lost in his own story. Aided by his – now alive – childhood toy monkey (Charlize Theron) and a man sized talking bug (Matthew McConaughey) Kubo embarks upon a tale familiar to him, and a tale that he and his mother could never recall and ending to. …It isn’t allowed to. The film has action and humour aplenty, carefully rendered characters both visually and in serving the tale as it unfolds. And while I rarely point out the soundtrack Kubo and the Two Strings has the most perfect Japanese infused score to elevate the film. 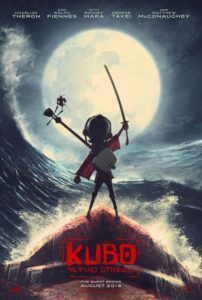 This might not have the ‘cute’ factor or sufficient hooks to drag in the mass audience that seemingly every animated film automatically receives, but since my initial viewing I have sought Kubo and the Two Strings twice more. Like Chef and The Big Year it has become a comfort film, and while I liked Finding Dory (you can’t not) this is twice the film that was, and the best animated film of 2016. Final Rating – 8.5 / 10. The best animated film of 2016 wasn’t really animated, and it wasn’t watched by nearly enough people.